First of all, I must apologize for the lack of pictures. My phone is not smart. It is well-intentioned, kind of fun to have around, with a great personality, but it is not smart, which makes taking pictures and transferring them into the aether rather difficult. Not only that, but it was packed away either under layers of clothing or in my seat bag for the ride, and I was a little too busy worrying about the ride to do pics. On to the magic! Weather was pretty cold for the ride, starting out below freezing and never really warming up that much. The saving grace was that we didn’t really have much wind, topping out at about 10 mph, which is really unusual for spring time in Iowa (although it could be said that nothing to date HAS been usual for spring time in Iowa this year). Although my main goal in bringing a big bag was to have storage room for unneeded clothing, I never really took anything off except my face mask. Since I decided to ride my bike from my apartment to the start (and back again after the finish) I logged 140 miles from the start of the day to the finish (getting to 140 required me to noodle around a bit on my way home, but I had to round it out). The brevet itself took me 8:20, so I averaged out about 15 mph for the ride. On-bike time was closer to 7:25 (I was a little more leisurely in the contrôles), averaging about 17 mph on-bike speed. For the whole 140 my warm-up, cool-down, and noodling cost me some speed, averaging 14.5 mph total and 16.5 mph on-bike. At the start I opted to let a group of faster folks go since I didn’t have a lot of on-road miles in my legs, and my longest ride of the season was about 3.5 hours. I figured that trying to push that hard at the start might not leave enough muscular endurance to finish the ride, and judging by the beginning twinges of quad crampiness I got on the way home from the ride, I was probably right. I did burn a match to beat a train to a crossing (safely) south of Nevada. I settled into a good rhythm and then picked up a decent tailwind that took me to the first (informational) contrôle, where I stopped and downed my first 3 oreos. There were a few folks that passed me while I was munching, and later up the road once we picked up the High Trestle Trail I saw that they had coalesced up the road a bit. I decided to burn another match to pull them in to have a group to ride with into the second contrôle at the Flat Tire Lounge. Eating on the bike was somewhat difficult this time around, because I had to wear full-fingered gloves the whole time, which didn’t leave me a lot of dexterity to fiddle with baggies of oreos. This meant I took longer breaks at the contrôles, stuffing my face. At the next contrôle in Ogden I also decided to have “lunch”, a mini-tube of cheese flavored fake-potato-ish Pringles, which provided a nice infusion of sodium. This also gave me time to rest my knee which had started to get a little annoyed. The group finally broke up out of the Stratford contrôle, and I went solo the rest of the way. IT was heading back into Ames that I encountered my only mean chasing dog of the ride (there were two more dogs that gave chase earlier, but they were clearly of the “I want to play with you” chases rather than the snarling “I want to turn your calf into lunch” chase the last dog gave. I was in an awful gear to outrun a dog (headwind) but I managed to burn a match and sprint away from him. 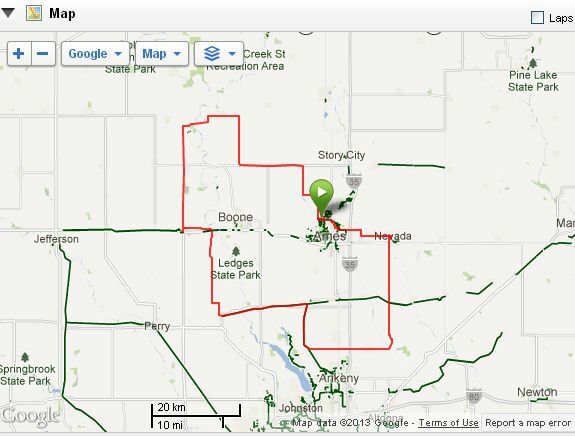 Any one who doesn’t believe there are hills in Iowa really needs to ride E18 with a headwind. The gradient isn’t huge but it’s constant, and as soon as you crest one hill another rises before you. I was 100 miles in at this point, getting tired, irritated, and was solo so I didn’t have anyone to kvetch to. This was the only point in the day where I would have considered giving somebody my bike if they had offered me a ride into town. It was, as Douglas Adams put it, my “long dark tea-time of the soul”. I finally took stock of the situation, stopped at the Highway 17 junction, and downed a few more oreos (numbers 20, 21, and 22 for the day), took on some hydration, and got my spirit back up. I was really counting the k’s because I knew that I would hit 200k on the day’s tally when I turned on to George Washington Carver. I would start seeing all the landmarks I hit when I do my TT training. Once I hit that point it was an easy roll in to the last contrôle, where the hotel manager, even though they were busy at the desk, pulled me aside, signed my card, and finished my brevet for the day, a gesture I really appreciated (Quality Inn and Suites, if you’re keeping score). Then it was just the ride home. All in all, I was very happy with all aspects of my ride this time around. I budgeted my muscular endurance very well, didn’t write checks early on that my body couldn’t cash, managed my nutrition well (even though it consisted only of gatorade, oreos, and pringles) and kept my hydration well within where I wanted it (I only lost a couple of pounds on the ride). I managed to keep my time spent in Zone 5 (anaerobic) to less than 1.5% of the total and stayed in Zone 1-2 54% of the time, which was pretty much what I was aiming for. My neck and back were complaining towards the end, but no more than they should be after 140 miles in the saddle. 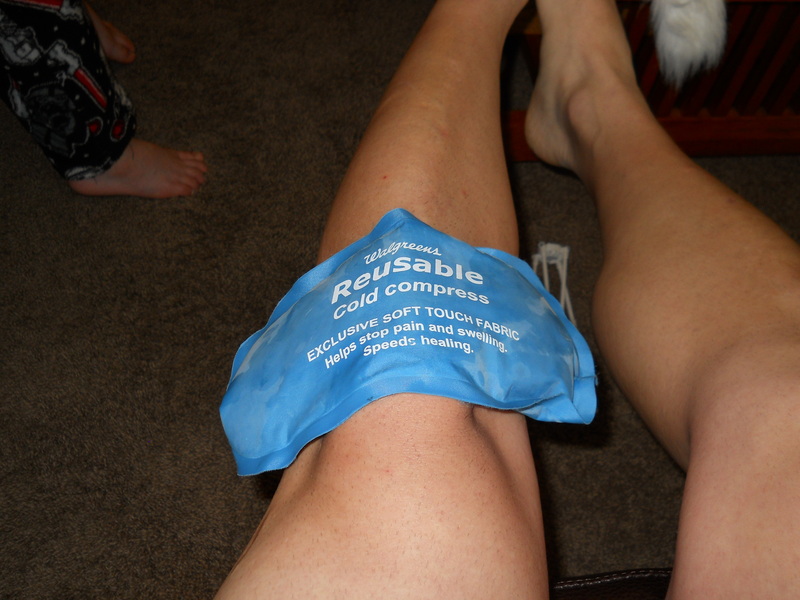 The only casualty is my knee, which is swollen and suffering from a little bursitis… a day or two of RICE won’t cure! A happy conclusion to the first big ride of the season! This entry was posted in The rest of the stuff and tagged bike, brevet, century, cycling, endurance, randoneuring. Bookmark the permalink.